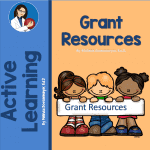 This grants page has grant information and templates of successful grant applications. Working with winners talks about working with community partners and companies to submit a PEP Grant Proposal. Participant Handouts for the Powerpoint presentation above. Community Partners for Health is pleased to announce that it is making available $15,000 in mini- grants. The goal of the Peaceful Playground project is to provide structured activities for youth during outdoor play that increase physical activity while decreasing conflict among children. Objectives include the learning of many new games and conflict-resolution skills. IAHPERD Association Grant for Physical Activity- Peaceful Playgrounds Narrative. Funded grant. The Learning Grants funding seeks proposals from District professional staff as well as advisors and/or coaches of school district sanctioned clubs for an innovative student project. The Eagle Foundation is committed to supporting educational and enrichment activities within the Cumberland Valley community. Grant resource for writing Community Transformation Grants for Physical Activity (Peaceful Playgrounds Narrative). Alignment to CTG Guidelines. 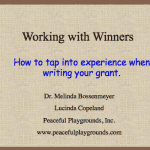 Peaceful Playgrounds Narrative and supporting documentation for the grant application. Lowes Toolbox Grant Template for submitting a Lowes Grant Application. Sample project: pre-application checklist, application overview, Project name, project budget etc. Northpoint’s Champions for Healthy Charter School Kids program will provide research-based nutrition and fitness programming at three Minneapolis charter schools, where students have high rates of poverty and obesity. The program will incorporate nutrition and fitness activities into the school day as well as modify lunch menus to meet the caloric intake and health and nutrition recommendations of the USDA Food Pyramid. Students are expected to increase their knowledge of healthy food choices by 50-percent and increase their level of activity by 20-percent. The program serves 850 students between the ages of 5-14. I first became aware of grant writing as a teacher more than 25 years ago. My first school grant was for $300 for additional teaching supplies. It was a short grant appropriately titled “A Mini-Grant”, and was funded by my district. Some 25 years later, I have written Federal grants, State grants, and foundation grants, most of which were funded.